Curious about what happened when? Or when budget decisions will be made this year? Check out this handy calendar of the emerging timeline. Adapted from the Center on Budget and Policy Priorities, subject to change. Earlier this spring, the skinny budget was released which outlined which programs may be cut and by how much. The skinny budget does not outline tax proposals nor any changes to entitlements. 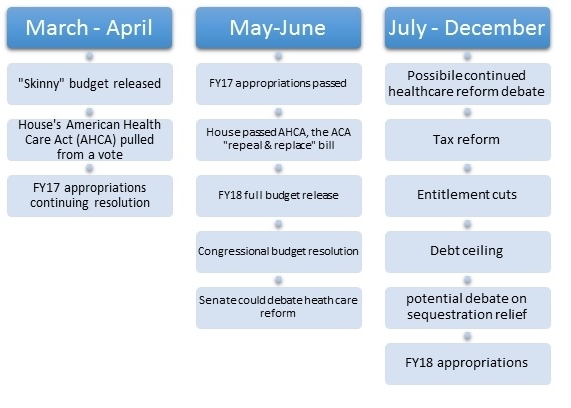 In addition to the skinny budget, Congress released the American Health Care Act (AHCA) and passed a continuing resolution on fiscal year 2017 (FY17) appropriations. In the first few weeks of May, the FY17 appropriations were passed to fund programs through September 2017, the House passed the AHCA. The fiscal year 2018 budget proposal is expected to be released in late May which will provide more detail on proposed shifts and cuts to non-defense discretionary programs. This release sets off a summer of advocacy, committee hearings, debate and Congress’ budget resolution which will set forth the amount Congress intends to spend in each of 19 spending categories and how much revenue the government will collect in the next five or so years. Congress’s budget resolution could be very different from the executive’s full budget proposal. The budget is “due” on October 1. If it does not finalize appropriations, it can pass a short-term “stop gap” funding bill to give themselves some more time. You can expect the healthcare reform debate to carry though the summer and for the tax reform, entitlement cut and other federal issue proposals to be introduced and discussed votes later this year.